Most people underestimate the value in caring for their windshield wipers, until it’s too late. With weak windshield wipers, a sudden storm can leave you in serious trouble. The truth of the matter is that your wipers should always be in excellent condition before you are in serious need of them. Keeping your windshield clean and your wipers in top shape gives you the ability to see clearly what is going on around you on the road. Clear visibility on the road can be a life saver. That’s why taking the time to think about preventive maintenance on your windshield wiper blades is critical to safe driving. Between snow storms, rain, bugs and debris that build up on your windshield, your wipers do a lot of work. The standard wiper blade wears out quickly. The rubber on the blade can begin to wear down as early as six months. For preventative maintenance we suggest that you change the wiper blades at least once a year. The best time to replace them is in the fall right before the cold weather begins. Do Your Windshield Wiper Blades Need Replaced? To check if you’re due for a replacement, gently wipe the blade to remove dirt. Next, simply run your fingers down the rubber portions of blade. If the blade is not smooth, then it is time for a new one. You can also tell the rubber is worn down when you see water streaks left behind after using your wipers. There are several things you can do to ensure you have the highest quality windshield wipers on a day-to-day basis. These tips are especially essential during inclement weather. If your car is parked outside and ice or snow is predicted, gently pull your wipers off of your windshield. This keeps them from freezing to your windshield which can cause breakdowns in the rubber. 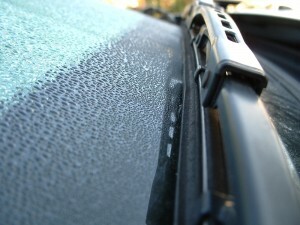 If your windshield does frost, be sure to scrape the windshield before using the wipers. Turning on your wipers to help knock off snow and ice is very harmful and will increase your chances of replacing the blade sooner than expected. On particularly sunny days try parking in the shade. Keeping your wipers directly in the sun will cause breakdown to occur as well. The sun dries out the rubber in the wiper causing it to become hard and to possibly chip. If you need to clean the windshield always be sure to use wiper fluid before you turn the wipers on. Never run your wipers on a dry windshield.